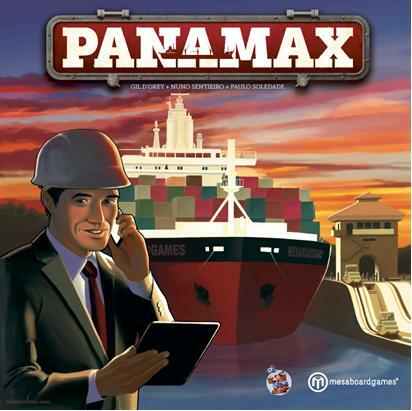 Stronghold Games and MESAboardgames are proud to announce jointly a major 2014 hobby board game release, Panamax, an economic game of ship and cargo movement through the Panama Canal. The release of Panamax is timed to celebrate the 100th anniversary of the opening of the Panama Canal, still one of the most important and impressive engineering achievements of modern times. Its economic impact developed the region and changed shipping worldwide. Ships around the world are built to a maximum size specifically to be able to traverse the Canal. These ships are called PANAMAX. In Panamax, players represent companies established in the Colón Free Trade Zone, the largest free port in the Americas, at the entrance to the Panama Canal. Players will negotiate contracts to use ships that arrive at both entrances to the Canal, coming from the USA, China and Europe, which will enable them to profit from the cargo and ship movement. Players will deliver containers onto ships, move ships through the Canal by opening and closing the locks of the Panama Canal, obtain better contracts, invest in the stock market, and hire the best people to work for their companies. Panamax utilizes several original game mechanics. The highly interactive ship movement system requires players to move their ships through the locks of the Panama Canal, which will also push other players’ ships through the canal simultaneously. This ship movement must be done as efficiently as possible, while not providing too much benefit to the other players’ ships. There is also a die-based action selection system, whereby players remove dice from the movement or cargo loading areas to perform actions. Timing and efficiency of a player’s actions in Panamax is crucial to victory. 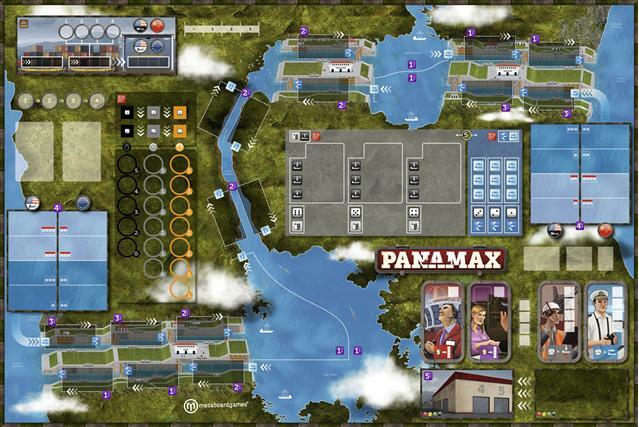 Panamax is scheduled to premiere in Essen, Germany in October at the annual Spiel game convention. Stronghold Games may have advanced copies available to demo or purchase at Gen Con in Indianapolis, Indiana USA in August. Stronghold Games LLC is a publisher of high-quality board and card games in the hobby game industry. Since 2009, Stronghold Games has released many highly-regarded games, including the best-selling “Survive: Escape From Atlantis!”, the most innovative deck-building game, “Core Worlds” and its expansion “Core Worlds: Galactic Orders”, and the latest smash-hit game line “Space Cadets” and “Space Cadets: Dice Duel”. Stronghold Games publishes great game designs developed both in-house and in partnership with European publishers. Stronghold Games LLC is a Limited Liability Company formed in the State of Delaware, USA. Founded in 2010, MESAboardgames is the first and still only Portuguese Publisher of high quality boardgames. It’s bestselling games “Caravelas”, “Vintage” and “Kosmonauts” are knowned to be very strong thematic games, where players can realy experience the role of a XV Century navigator, an Oporto Wine Producer or a Space Ship Pilot. MESAboardgames publishes games designs developed in house and in partnership with other authors. MESAboardgames is a Limited Liability Company formed, registered and based in the town of Cascais, Portugal.